As a diabetic, barbecue sauce is a sauce that generally needs to be avoided because of all the sugar. 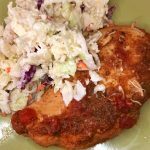 But, this barbecue chicken recipe is low sugar and it’s super easy… throw all the ingredients in the slow cooker, and then enjoy!! This is a favorite in our house, the easy cole slaw recipe is a great side for this delicious chicken dinner!! Serve it with this low sugar, diabetic coleslaw recipe. Add all ingredients to the slow cooker & cook on high for 4 hours. If you prefer low, you can cook for 5-6 hours. When done, shred chicken or serve whole. The chicken will be tender so keeping it whole is a bit difficult. 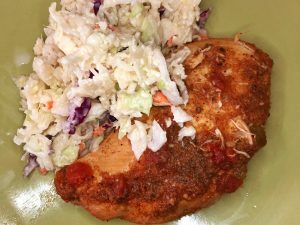 Serve with cole slaw & enjoy! !